After a wretched summer, the weather here in the UK has suddenly improved markedly in the last few weeks. Partly for this reason, this early-autumn edition of the newsletter has a lighter, more-carefree feel than usual. I hope no-one minds—I will return with something more erudite and serious later in the year, by which time I am confident that the habitually dismal British weather will have reasserted its stranglehold! The biggest event that took place this summer in the UK was of course the Olympics. I don’t want to get too parochial as I know I have subscribers in a number of different far-flung parts of the globe but the Olympics were fantastic not just for British sport but also for the entire country. I attended four events over the course of the fortnight and it was wonderful to see so many people from all manner of nations happily coexisting and enjoying a superb festival of sport (and sportsmanship). When the Olympic flame had been extinguished I couldn’t help thinking what Nigel Balchin would have made of it all. As a keen watcher of sport throughout his life and a very talented sportsman in his youth I think he would have approved. At school, he excelled at football, rugby, cricket and hockey. Once he became a working man, Balchin adopted a much more sedentary existence, but he still played a handful of sports, notably cricket and golf, well after he became established as one of Britain’s leading popular novelists. In 1947, he said that, where sport was concerned, he specialized in “looking like a good player out of practice”, and a few years later he added that he had played “almost every sort of game except polo”. Sport was not an integral feature of Balchin’s writing but it does crop up from time to time. Some of his articles for Punch in the mid-1930s (which are among his earliest published examples of penmanship) took sport as their subject and it later featured in at least two of his novels. School rugby matches (in which Jason Pellew stars as a highly unconventional scrum-half) are described in The Fall of the Sparrow and Walter Parrish participates in a cricket net session with Hawes, the curate, in Seen Dimly Before Dawn. We should also not forget that one of the first books that Balchin published was entitled Fun and Games. How to Win at Almost Anything, and comprised a humorous examination of the strategies required to succeed at a wide range of different sports and pastimes. So, in the wake of Britain’s 29 gold medals it seems somehow fitting to focus attention in this newsletter on some of Nigel Balchin’s achievements. I’ve compiled a list detailing his greatest accomplishments and have also included a short quiz to test your knowledge of Balchin’s life and precisely what he did (and didn’t) achieve during it. Elsewhere in this issue, I also provide the latest news on the writing of my biography. I will return with another bulletin at the end of the autumn. In recent years, reference books, magazine articles, radio documentaries and the gigantic electronic rumour mill that constitutes the internet have combined forces to propagate a substantial number of myths about Balchin’s life and career. Take this quiz, sift the facts from the fiction and find out how much you really know about him! Answers on page 5. 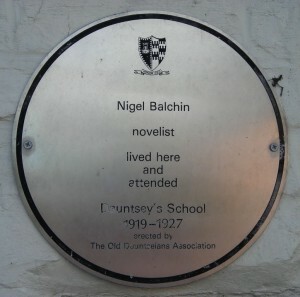 A plaque on the front of one of Balchin’s childhood homes, but where was he born? There is still no news to report on the literary agent front. I have attracted a few nice comments about my work, scattered amongst a large stack of rejection letters, but as yet no-one has expressed interest in representing me. The line I am being peddled is that my work is insufficiently commercial to take a risk on during this dire period for the UK publishing industry. This is more or less what I was expecting, although it is still a little galling to read those words over and over again in stark black letters. I have a couple more agents on my list left to try and I will also approach a handful of publishers before the year is out. Thanks everyone for your patience as I strive to write the best book about Balchin that I possibly can. All the struggle will I hope be worth it in the end! What Was So Special About Nigel Balchin? This is a question that people ask me periodically. I suppose the honest answer is that there was nothing truly extraordinary about Balchin but he certainly led a full and very interesting life and one that was packed full of accomplishments. So, to help me next time I am asked the question in the title of this piece and also to act as a taster for my forthcoming biography, I present below a list of notable entries on Balchin’s CV. He wrote The Small Back Room, a novel described by the Guardian in 1970 as “one of the sharpest pictures of how people lived and felt in Britain in the Second World War”. He almost died when he was just 18 months old, tipping a kettle of boiling water over himself and being so badly scalded that for a while he was not expected to live. During World War Two, Balchin helped to revolutionize personnel selection methods in the British Army, largely by introducing a primitive form of computerization. A colleague once said that the personnel selection work carried out by psychologists such as Balchin “transformed morale in the British Army from zero level in 1942”. Balchin wrote screenplays for a host of interesting movies in the 1940s and 1950s, including the Ealing tear-jerker Mandy, as well as successfully adapting his own novels Mine Own Executioner and A Sort of Traitors for the screen. According to his friend and fellow novelist Elizabeth Jane Howard, Balchin was the highest-paid scriptwriter in the world when he landed a three-year contract with Twentieth Century Fox in the mid-1950s. On 7 May 1945, just one day before VE Day, Balchin was appointed Deputy Scientific Adviser to the Army Council and promoted to Brigadier, a remarkable achievement for a man aged just 36. 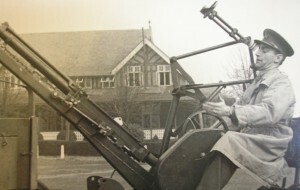 “The Reeves gun is one of the most promising developments I’ve seen…” Balchin grapples with something similar during his wartime Army service. He played Minor Counties cricket for Wiltshire in 1930. Among serious fiction writers, only Arthur Conan Doyle and Samuel Beckett appear to have played the sport to a more exalted level. 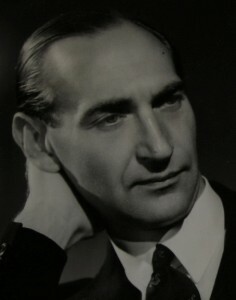 Balchin won a BAFTA in 1956 for his script for the film The Man Who Never Was. When he left university in 1930, Balchin became an industrial psychologist, one of a very select band of such professionals in Britain at the time. He wrote the first draft screenplay for the film Cleopatra, which when released into cinemas in 1962 was the most expensive film ever made. Balchin later took great pride in announcing that he had been responsible for the “first folio edition” of the Liz Taylor/Richard Burton blockbuster. In the mid-1930s, Balchin conceived of the famous ‘black box’ design for Rowntree’s new chocolate assortment Black Magic and was intimately involved in the huge market research project that preceded the successful launch of the product. He had a tempestuous private life, losing his first wife to the painter and sculptor Michael Ayrton, enduring a stormy and fractured relationship with his second wife (a Yugoslav émigré who was much younger than him) and battling against alcoholism for most of his successful period as a novelist. His success as a film scriptwriter led him to become a tax exile, and he lived in Hollywood, Florence and Paris during the 1950s and early 1960s. In the person of Jack Partridge, a minor character in his 1953 novel Sundry Creditors, Balchin seems to have unwittingly invented the ‘Angry Young Man’, a type that would become a staple of British fiction for the remainder of the decade. Beginning in 1945, Balchin lived in a succession of sumptuous properties all over the world, as he chose to invest the money he was earning from writing successful novels and film scripts in upmarket bricks and mortar. One of these properties, Tufton Place in Sussex, apparently had a grand total of 48 rooms! False. The word does not appear in the novel. False. He obtained a BA Honours degree in Natural Sciences, not Psychology. False. He was born in Potterne, Wiltshire. His family moved to West Lavington towards the end of World War One and he went to school there. True. He ran a combined bakery and tea shop in West Lavington. False. Rowntree’s had registered the name as early as 1911, long before Balchin started going to school! True. The phrase appears at least three times in the novel. False. Balchin’s first novel was No Sky; Lightbody on Liberty was his third novel. False. He enjoyed growing fruit in his garden, especially when living in Kent just after the Second World War, but he never actually earned his living from fruit farming. False. Or should I say, I have yet to find any solid evidence in support of this claim! 9–12: Outstanding! You should be writing Balchin’s biography instead of me! 5–8: Commendable. You have a good all-round knowledge of all things Balchin-related. 0–4: Keep reading these newsletters! NB. All of the ‘false’ answers are genuine claims about Balchin that I have read over the years, either on the internet or in published writings about him, including some reputable reference books. There are plenty of other ‘myths’ that I was unable to include for reasons of space. I am very sad to report that Nigel Balchin’s daughter Cassandra died in July after a battle with cancer. As a very small child in 1963 she made national headlines when Balchin rescued her from a burning nursery at their home in Sussex. In adult life, Cassandra became a highly respected campaigner for women’s rights around the world, but especially in Pakistan, where she lived and worked for many years. I met Cassandra on a number of occasions and she was a great help in the early days of the research for my biography. Following her father’s lead, she once said to me that “I consider myself a writer” and I’m sure that, had he lived long enough to know her when she was an adult, Balchin would have been proud of his daughter not just as a fellow writer but also as an exceptionally decent human being. She will be greatly missed.